Written by Duncan Heather on March 8, 2018 . Posted in Blog. There is an enormous choice of wholesale plants in the UK. From independent nurseries like Orchard Dene, Babylon Plants and Farnham Common Nurseries, to large wholesale/retail nurseries like Hillier or Evergreen. For trade only consider nurseries like Coblands, Palmstead or North Hill. You may have to pre-order, as some nurseries are only open by appointment. While some like Hillier, Coblands, and W Godfrey & Sons offer a select & collect service, allowing you to hand-pick your wholesale plants. If you are looking for specimens trees/shrubs (usually Italian grown) with a limited selection of herbaceous plants, try Riverside Nurseries, Premier Plants or Classiflora. They have a relatively limited choice and you won’t get anything out of the ordinary. For specialist nurseries try Trehane Camellias or Millias for rhododendrons and azaleas. Avoid specifying plants that are hard to get hold of. There is no point is using rare exotics that only a few nurseries grow. As the chances of them being out of stock, are much higher than if you use common plants creatively. If you’re looking for herbaceous plants and grasses Knoll Gardens have an excellent choice, as does Beth Chatto via mail order. Do they grow their own? If so how? From seeds or plugs or both? How do they care for their plants? Check growing areas and potting-on techniques. Are they restricted in when they can supply plants I.e. spring/autumn. Do you have to place orders very early in the season to have your order fulfilled?. With smaller nurseries, it isn’t uncommon to have to order your plants 3-6 months in advance, so they can grow on your required numbers. Do they buy in? If so, from where? Plants originating in the UK are usually tougher than plants brought in from Italy/Spain/etc. How do they manage their plants when they need potting on? Do you go to specialists? Yes, if the project warrants it. For instance, do not go to a general wholesale nursery for “green roof ” mats – always go to the grower such as Green Rooftops. Quite a lot of nurseries purport to supply all your needs but frequently quality does not come up to standard. Wildflower turf can be bought in from specialists and although expensive will give better results. Anglo Aquatic specialise in water plants but only sell to trade in trade packs but again do have a good range of plants. If you are supplying plants it goes without saying that they must be the best quality. Unfortunately quality can vary tremendously and you need to keep an eye on it the whole time as even the best of nurseries can let you down. It is essential that you supply only the best quality available at your cost level otherwise you will have an unhappy client if what is planted looks scrappy, ill and does not survive. Be on-site to take delivery and check the quality and quantity. Any rejects must be put aside and the nursery informed immediately. Beware – only accept substitutes that fit the bill. Make sure that on delivery that subs have not been slipped in. I personally never accept substitutions. It’s lazy and I want to be responsible for the plant choice. I don’t want the nursery to try and offload surplus stock which doesn’t fit with my scheme. If they don’t have what I want, I would rather look for it elsewhere or wait until new stock becomes available. As the designer, should you supply the plants, or should your contractor supply the plants? The choice is yours and it is dependent on you and the way in which you run your business. Technically this isn’t as straightforward as it sounds. For a start, your role changes from designer to the supplier. And you will need a new contract with the client. If you supply the plants, you can control the quality and you will make better margins, commonly up to a 100% mark-up. But you also take on the responsibility of the warranty. If you supply the plants, I believe you should replace any that don’t survive the first growing season. This costs money and time. If you specify and allow your contractor to supply the plants, the responsibility will be theirs. This enables you to meet the people who run the nurseries and for you to have an idea of the stock that is car­ried and the quality. Many nurseries have open days such as Rivermead and Palmstead. 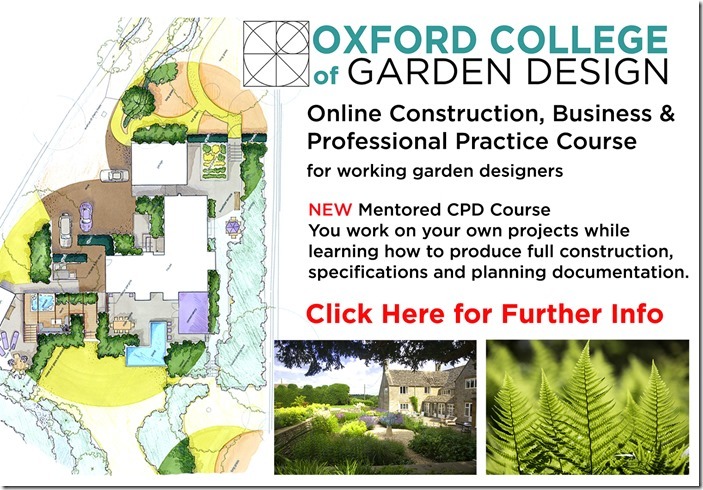 A number of nurseries also run “seminars” and “workshops” for landscape & garden designers. These are often educational and worth attending. Try Knolls’ designer days and Palmstead’s seminars. Talk to the staff, see if they are trained, what backgrounds they come from – a staff with good knowledge will give good advice and make fewer mistakes. Look around to see if they are over/under watering, see if their weed control is in hand or if the stock looks neglected. The pot surface should be free or weeds and moss and the beds clean and weed free. Check the labeling, as some nurseries have a reputation for mislabelling. Do you even want individual plants to be labeled? Most do not but make sure that any trays are correctly labeled and avoid mixing plants from different trays. Check out their sustainability rating. See if they are moving towards good husbandry, Irrigation and water recycling. Do they use of eco pots, composts, etc. See the Hairy Pot Company’s range. It takes a lot more time to do this than you expect. Start now before you get busy with design work. Try and meet as many nurseries and their personnel as possible. Continue to build up a professional working relationship and then you will find that they become extremely helpful over the coming years. Don’t expect all nurseries to operate in the same way. Some are extremely helpful and run an additional service to source the whole of your list. While others just want to sell wholesale plants to whoever will buy. Understand that they do not all sell the same pot sizes. If comparing quotations, you have to be aware of the differences and quite often you are comparing “apples with pears”. You should always specify pot size with the order and ask the nursery to highlight any changes to these when quoting. Emails lists are usually sent these days to save paper – but to compare these lists you will need to print them out, so the costs get landed on you. Beware some Nursery lists are over 100 pages long…. This will normally be quite routine but you will have to supply two business references and you will have to apply on printed letterhead to prove that you are indeed a trade customer.